INFINITI M56 keyless entry remotes up to 75% OFF dealership prices available on our website. 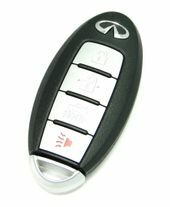 Purchase online or call 866-690-4308 toll-free to buy your replacement key fobs for your Infiniti M56. Infiniti M 56 remote rubber covers also available.